On Moxie, 30 minutes before the hurricane hit. A few days before Irma hit Trav was checking the weather like it was his full-time job . Viv decided he needed a break from weather-checking so she could dress and accessorize him...like the fashionista he is. Please note the little dog on the leash. The day before the hurricane was a fine time to chop up some meat and fry it on the sidewalk! 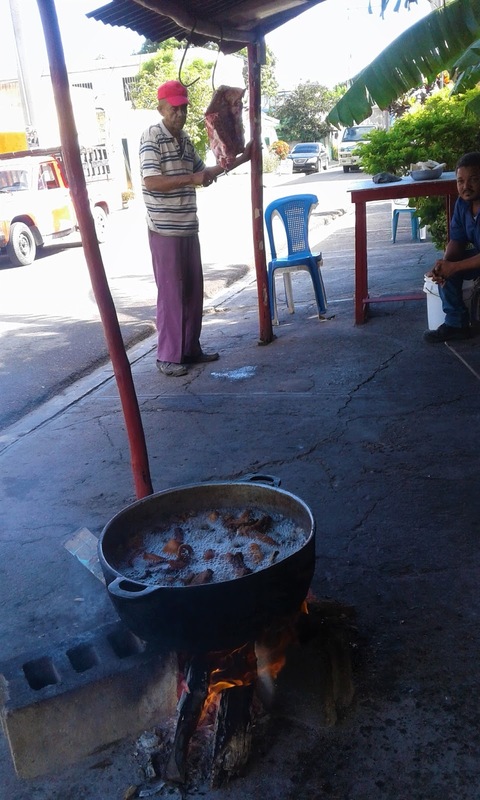 As Travis noted to a friend, "I am pretty sure that if you tried that in the US you would attract the attention of at least ten government officials... 'Hey I am just butchering some meat over here and then deep frying it over an open fire on the sidewalk!'" In the US, we have at least fourteen laws that prevent this kind of who-ha from occurring. (And the Moxie crew digs a little more who-ha in our lives). Now look at this photo and compare it to the last one. You might be asking, "WHERE IS CRAZY CHRIS' TRIMARAN?!?" And the answer is, Irma blew it off its anchor. When Travis met with Crazy Chris after Moxie was damaged by his badly-secured boat, Crazy Chris lived up to his name, got all wild-eyed and spewed and shouted and flat-out refused to accept any blame or cover any damages. We knew he wasn't going to take any steps to secure his boat, and we knew that Irma was going to rip his boat off its flimsy anchor. This was 75% of the reason why Travis stayed on Moxie during the hurricane, to watch out for the loose trimaran. Sure enough, we were right. The trimaran was like that Mike Tyson fight where he knocks out Micheal Spinks' in less than one round, the wind had hardly picked up and his boat was gone. 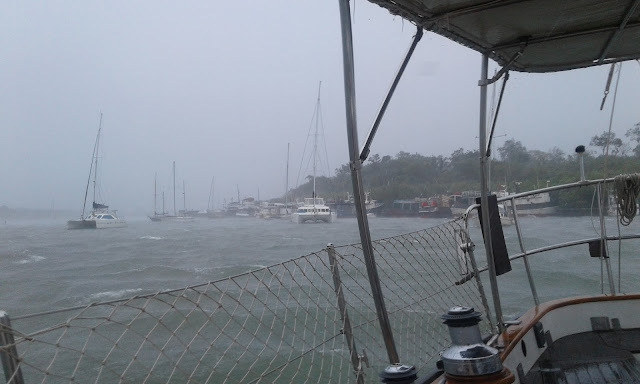 Luckily, it didn't hit ours again, but it did hit three other boats during the course of the storm. We lucked out, the storm tracked north of us by 55 miles, just enough to allow us an interesting story, but nothing that Hollywood would want to make a movie of. When Irma hit Luperon the winds blew between 40- 50 mph, sometimes gusting up to 80. 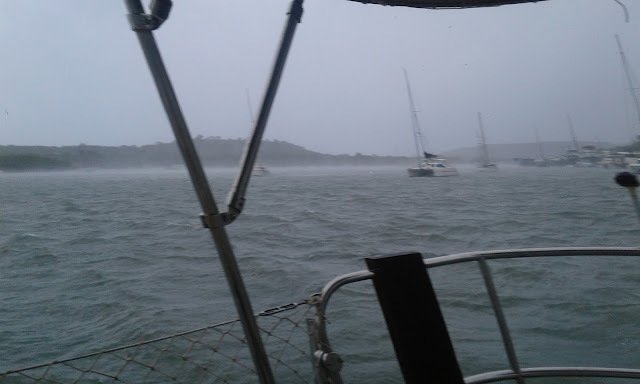 Trav took this photo on Moxie-- it's hard to tell bit the boat was heeling from the wind. While Trav stayed on Moxie during the storm, the rest of us were holed up in Casa De La Sol, the sweetest little hotel in Luperon. Here are Viv and Hud with our buddy Claire (from another sailboat, SV Clarity) and the hotel owner's daughter and niece. The hotel folks treated us so kindly, and were so appreciative of their care of us during the storm. We definitely had a few stressful moments during the Irma, like when the wind picked up and the power went out, but we kept the troops happy and feeling safe, fueled by a steady diet of junk food (all that the 1 open store was selling). We went without electricity for over 24 hours and no running water for 12, but that's a drop in the bucket compared to how other people affected by Irma have suffered. The DR was very, very lucky. At our condo building the day after Irma. The ocean had surged over the pool and almost reached the building. 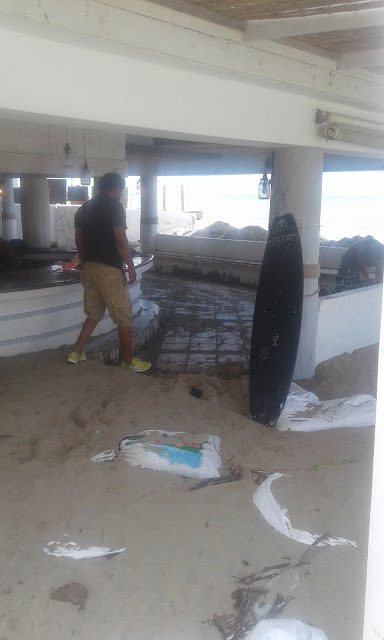 It was a big mess with sandbags everywhere and lots of broken decking, but after a few days of clean up, the place is almost 100% back to normal. The broken sand bag wall where we live, post-Irma. Cleaning up the restaurant at our condo. The place had been entirely filled with 2 feet of sand. Since the storm, we've gotten back to normal. Paddle boarding and snorkeling off the beach in front of our condo. Jen said, "No, don't drive on the beach!" Travis, apparently needing MORE adventure in his life (or possibly just blind to the fact that he was driving an $8.34 a day rental car with bald tires and over 200,000 miles on it and every light lit up on the dashboard) decided that driving on the beach was an excellent idea. The four of us constructed a driftwood "road" in 95 degree heat that did not do the trick. Luckily, a boatload of German tourists were ready to push and saved the day. We paddled to Wilson's Restaurant. You can only get to it by boat (or I guess you could swim). When drink options include virgin pina coladas served in pinapples and rum drinks in coconuts, you already know what this gang is ordering. Don't have a paddle board or a boat ? No need to worry, Wilson built his own boat and they will pick you up in it! At a baseball game near Cabarete. Hud and Viv with their friends Anderson and Marlon. Horseback riding in the mountains near Cabarete with some of our friends was an absolutely incredible day. Viv was SO excited to be riding her own horse. Later on she told us, "Because I got to ride by myself I could really pretend things!" I asked her what she pretended during the ride and she whispered it into my ear: Cowgirl and Indian Girl. We love our sweet Moog. And see the other little girl behind her? That's the daughter of the ranch owner. Five years old and she rides like a professional. We rode through narrow, winding paths, up sand down steep hills, through deep mud, through forests and rivers. AND WE GALLOPED. Halfway through the rise we stopped in a little village. This was its 2-room schoolhouse. At the top of the mountain, we bought snacks and drinks from this tiny store. The guy turned on the music for us (extremely loud , as is the awesome DR custom) and we enjoyed ice cold Presidente beer in little plastic cups (also the DR custom). One of our favorite photos of Viv with her bestie Alba. These two pretend and imagine for hours on end. 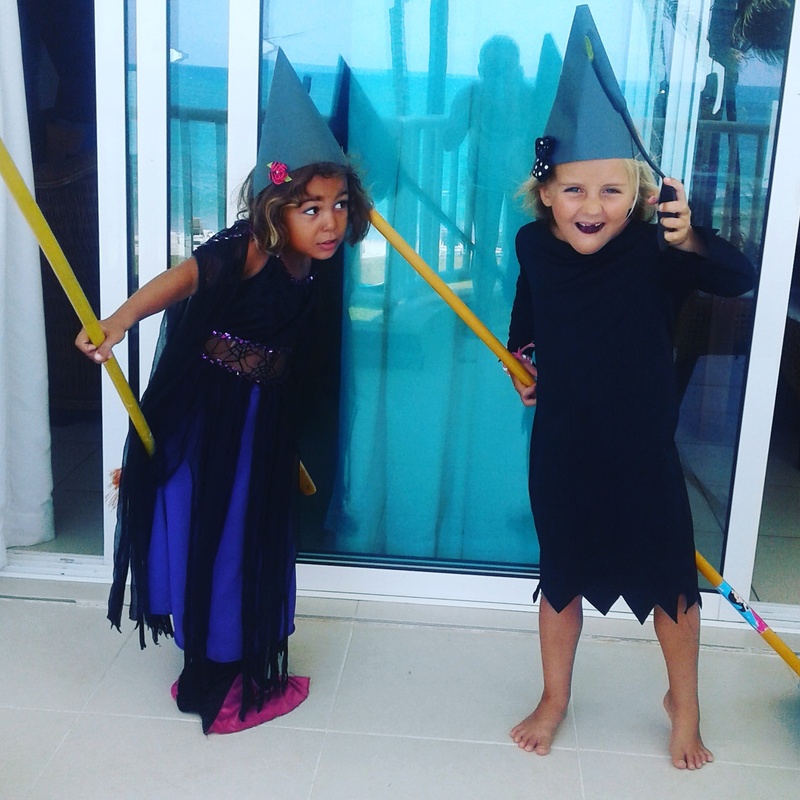 And being witchy is their specialty. Watch out, ocean! Jen is making all of her childhood Gidget dreams come true. This guy. He can surf (really well), kite surf, windsurf, wakeboard, and boogie board. And he'll try anything. Love our Hud. Grateful, grateful, and more grateful. That's what we are, now more than ever since Irma. 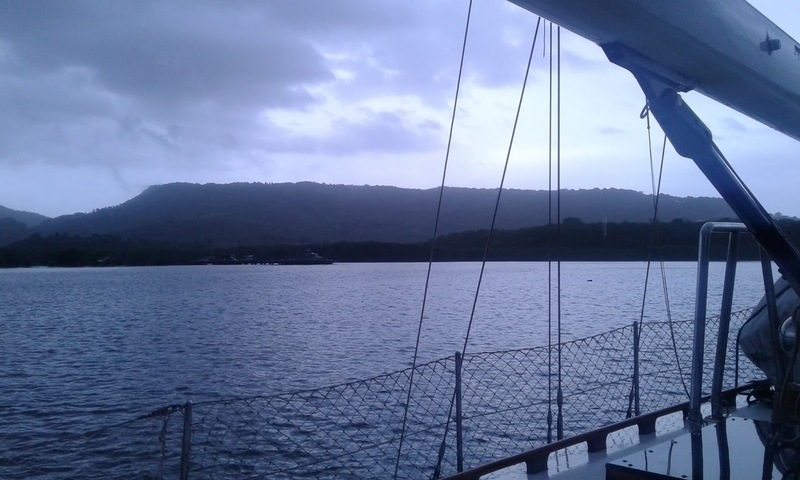 The days leading up the hurricane (and especially the day right before) were some of our most stressful in this whole sailing experience. Trav watched the weather like a hawk for days on end but the reports were inconsistent. Some forecasts showed Irma going north of us by 50 miles at sea, some showed it coming much, much closer. 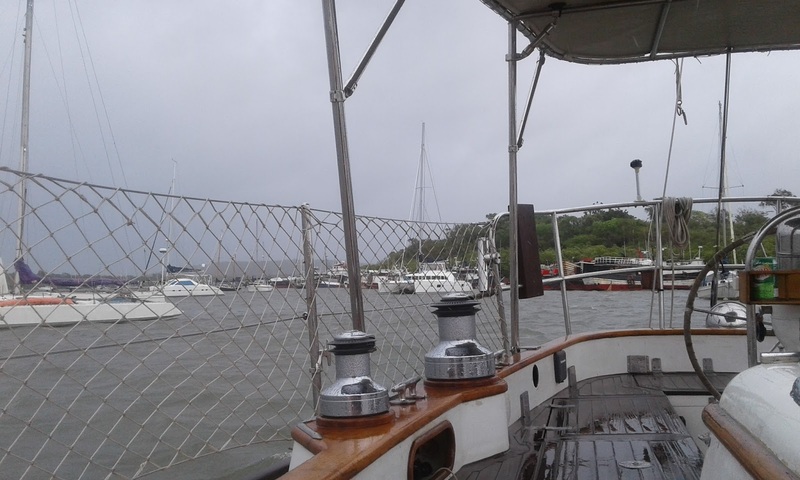 Chris Parker (the weather guru for sailors) predicted that we'd be hit full-on, with 80 knot winds in Luperon, where Moxie is moored. We prepped for the storm, taping big Xs on the windows of our condo and moving all the deck furniture inside. We ultimately decided that as long as the wind predictions stayed at 50 mph or less in Luperon, then Trav would stay on Moxie during the storm. This way he could turn on the motor and move the boat if another boat came loose (see "Crazy Chris" stories in captions above) and just be there in general to do what it took to keep the boat safe. The kids and I had planned to stay in the condo in Cabarete for the storm, but as the forecasts intensified we decided two things: 1. Staying in a condo with huge windows facing the beach felt a bit sketchy and 2. Staying 1.5 hrs apart from each other during a hurricane didn't feel right either. So after spending a full day prepping Moxie for the storm, Trav drove back to Cabarete and brought us back with him to Luperon, where we checked into a little hotel (one that was way, way off the beach). 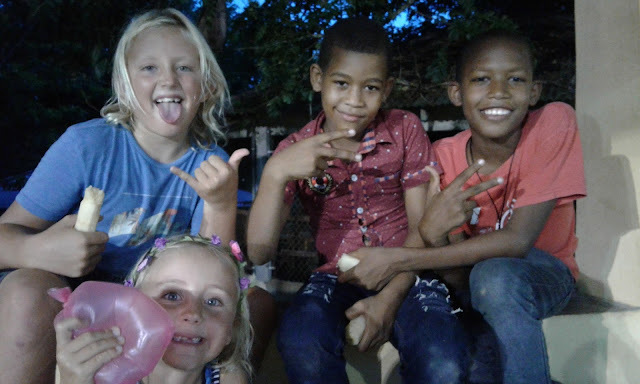 So while Trav and some of the other sailors in the harbor prepped and manned their boats, my friend Meg (of SV Clarity) and our kids held down the fort at Casa de La Sol hotel. We homeschooled, we had a mini-drama class, we made crafts and we ran around in the rain. We lost power when the wind picked up and eventually lost running water, but we kept busy and that was the key to not letting fear and "what ifs" creep in. Big thanks to all the friends and family members who reached out to us with their support and concern as Irma grew close. AND we must give a GIANT shout out to a dear friend who truly helped us when we needed it most. Jonathan Ives, a fellow sailor and Telluridian, sent Trav constant and EXTREMELY THOROUGH weather updates from the US in the critical hours leading up to the storm. With our crappy internet here, this was a godsend. Jon spent hours researching and interpreting the weather data for us, gave us lots of great advice, as well as bucket loads of moral support. Jon, you are the best, THANK YOU from the bottom of our hearts!! We ended up being very lucky. As we mentioned in the photo captions, Luperon only saw 50 mph winds with up to occasional 80 mph gusts. 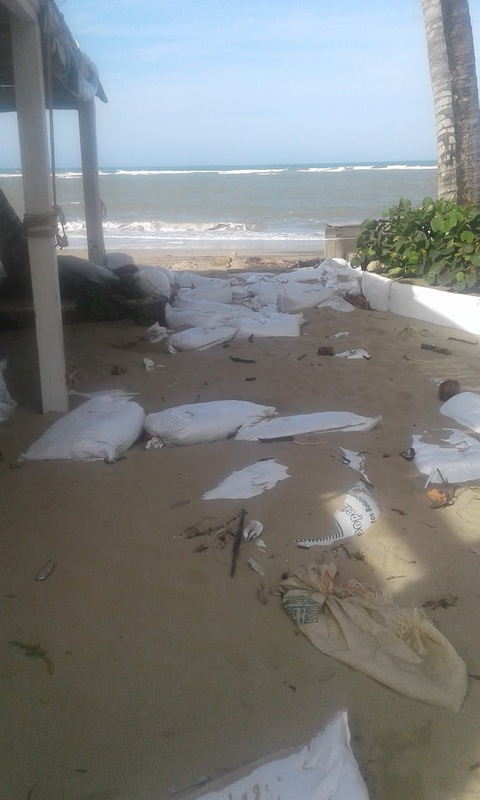 there was no damage to Moxie, minimal damage to Cabarete, as compared to the utter catastrophe seen by other places. Our hearts are so heavy for the people who have suffered here in the Caribbean, and in the US. We've had many personal friends who have suffered losses from Irma. Our friend John Sopsic's house (where he lives full-time) in USVI sustained major external damage. Our friends Joanne and Jeff Moody have a catamaran in BVI that Irma inconveniently parked another cat on top of. And some Telluride friends, Chris and Amy Cooper, who worked so hard to obtain their boat and learn to sail just this year, tragically lost their sailboat-- she sank in the BVIs. As a sailing family, the Coopers' loss hits very close to home, as we know so well how much exhausting effort, planning, sweat equity, determination and love it takes to own a sailboat. Your sailboat is a floating, tangible representation of your hard work and your dreams. Our friends lost this, and we are so sad. We've been thinking of you guys a ton, so glad to hear so far so good, hope all the storms kids you guys!!!! *miss you guys that is!! Thank you for this thorough diary of your adventure during the hurricane. I'm about as far away from all of this as possible, in Bellingham, WA but I thought of you often and worried still. Glad you are all ok. Thanks for the good thoughts, Marla! !